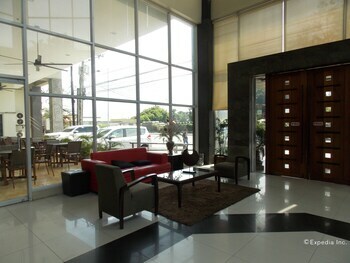 Located in Bacolod, East View Hotel is within a 15-minute drive of Negros Museum and SM City Bacolod Northwing. Featured amenities include a business center and dry cleaning/laundry services. Free self parking is available onsite. With a stay at ZEN Rooms Malate Robinsons in Manila (Ermita), you'll be within a 15-minute drive of Baywalk and Rizal Park. Featured amenities include a 24-hour front desk and an elevator (lift). When you stay at Hollywood Drive-In Hotel in Baguio, you'll be within a 10-minute drive of Baguio Convention Center and Baguio Mountain Province Museum. Free self parking is available onsite. With a stay at Mar and Em's Bamboo Cottages in Daanbantayan, you'll be near the beach, just a 4-minute walk from Bounty Beach and 5 minutes by foot from Logon Church. When you stay at Parrot Paradise Resort in Alcoy, you'll be near the beach and 9 minutes by car from Eli Rock. A shuttle from the airport to the hotel is available for a surcharge.